As fences go, it now looks a rather sad specimen. The wood is rotting and the posts flop one way, then the other. "I've been bringing people here for 10 or 15 years, and the fence is starting to get a bit degraded," laments Carol Prentice, a researcher at the US Geological Survey (USGS). "Some of the trees are dying and I'm concerned that they're going to fall down and destroy this beautiful feature." You might add "historic feature", as well. This is one of the few remaining fences to still record the moment in 1906 when the San Andreas Fault ripped across San Francisco peninsula. The great earthquake struck at 0512 on 18 April. Here, beside a lake and a reservoir, just off Interstate 280, the ground broke and lurched northwards. The grey fence and the line of Monterey cypress trees were split and offset by a little under 3m (10ft). So early in the morning and tucked down in a valley, there was probably no-one around to see what happened. Twenty-five kilometres (15 miles) up the road, of course, was a different matter. The city of San Francisco - the "Paris of the West" - was shattered by the Magnitude 7.9 earthquake; and much of what was left standing after the minute of shaking was then consumed in a firestorm. It may be 100 years ago but scientists continue to investigate the event. For her part, Dr Prentice has been trekking across this region of California, looking for subtle surface features that trace the course of the San Andreas Fault. This information, combined with old photographs and maps, has been built into a digital database that householders can now use to find out where their property is in relation to the fault. All San Franciscans know they live along an active plate boundary, but very few will know precisely where the ground is likely to break. Many of the obvious offsets from 1906 have been covered over, eroded, landscaped, and, yes, even built on. "You can engineer for strong shaking; it's very difficult to engineer for rupture right through your foundations," says Prentice. Another Big One is inevitable; it is just a question of when. The Pacific and North American tectonic plates grind past each other at a rate of about 39mm (1.5 inches) a year. At depth, where the rock is more plastic, they flow without too much trouble; but nearer the surface where they are locked, the movement is loading strain over the entire San Francisco Bay Area. There are at least seven major earthquake zones in this locality capable of producing damaging tremors, and history says they will do so again soon. "In the 1800s, the Bay Area really rocked and rolled; there were something like 29 earthquakes of Magnitude 5.5 or larger between 1850 and 1906," explains Dr David Schwartz, the current chief of the San Francisco Earthquake Hazard Project. "But it's like you pop a balloon and you let all the air out: the 1906 went off with a 7.9 and turned this very active area off. "The 20th Century was a period of anomalously low earthquake activity; and it was during this period that the population developed and all the infrastructure was put in." Schwartz co-chaired the Working Group on California Earthquake Probabilities. Its 2003 assessment found there was a 62% chance of one or more M6.7, or greater, earthquakes in the Bay Area in the period up to 2032. For those who fear the worst, the Loma Prieta M6.9 event in 1989 was a clear warning. This quake released just 3% of the energy of 1906 and even though its epicentre was nearly 100km (60 miles) to the south, it still produced strong shaking and some $10bn of property damage and other losses across the Bay Area. It also cost the lives of more than 60 people, most of whom were killed in the collapse of the double-decked Cypress freeway structure in Oakland. Loma Prieta illustrated very well the vulnerabilities of the Bay Area. So much of its development has taken place on reclaimed land, on fill, with a high-water table; and these soft soils shake much more strongly than rock. This was particularly evident in The Marina, the district of San Francisco worst affected in the Loma Prieta event. Back in 1906, most of this smart neighbourhood did not even exist - it was a small inlet from the Bay. Head up to Twin Peaks, the second highest point in San Francisco, and you get a good feel for all this low-lying land. I stood with USGS geophysicist Jack Boatwright, as he pointed out the key features of the SF cityscape. Boatwright studies how different types of ground in urban areas will behave in an earthquake. "Look south of Market Street," he gestures. "It got creamed in 1906. All the reclaimed land started to slide back; there was a great deal of 'liquefaction', a great deal of what we call lateral spreading - what is really a flat landslide, in effect. "And it was in these low-lying districts where all the water mains were fractured. So as soon as the fires started up, there was no way to fight them." The Bay Area is running hard to catch up. It has spent or is committed to spend $30bn on seismic retrofit projects - and that is just public facilities. This includes the nearly $6bn that will be invested to ensure local hospitals are strong enough to ride out a major quake. The California Department of Transportation (Caltrans) has already laid out $3.5bn in upgrading and replacing the region's freeway overpasses and toll-bridges. It is a sum that will probably rise to $5.5bn once work has been completed on the San Francisco-Oakland Bay Bridge. This dominant Bay Area feature experienced a similar, although much smaller, structural failure to that of the Cypress freeway. In future, the 280,000 vehicles a day that use the crossing will no longer run an east span that has a double deck. Instead, they will use two separate structures with their own supports. And what of those water main problems of 1906? Well, the San Francisco Public Utilities Commission (SFPUC) is engaged in a $4.3bn effort to make sure structural integrity is maintained on the gravity-fed system that brings water to the Bay Area all the way from the Sierra Nevada mountains. "You could see in the aftermath of Hurricane Katrina how water is actually the principal issue following disasters," says the commission's deputy general manager, Tony Irons. "You can live without electricity, you can live without petroleum - you cannot live without water." But whereas many public structures look in good shape - SF's historic City Hall now sits on rubber dampers - the same cannot be said of private residences. 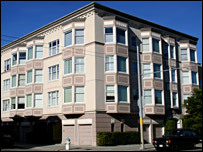 Over the years, San Francisco buildings were built to an architectural style that will do them few favours in a big quake. "Soft first-floor", it is called. Typically, this involves a garage at ground level (or first floor as they call it here) with the house above. The design is inherently weak during strong tremors. "Under gravity, it works fine," says Dr Mary Lou Zoback, a senior researcher at USGS, "but when you start shaking and moving the building sideways and back and forth - if it doesn't have enough shear strength and it collapses, then everything falls above it." Many householders will have upgraded their garages to give them added protection. A great many will not have done so. This is a city of renters and tight rent control; landlords may not have seen the incentive to carry out a costly retrofit. One recent report found that 70% of the damage expected in a repeat of 1906 would hit residences; with something like 38% of buildings destroyed. Earthquakes are a game of chance. The Big One could come tomorrow; it may not come for decades. The probabilities say that if it does happen it will likely come first in the east Bay Area, along the Hayward Fault. There, the city of Oakland is busy preparing its 411,000 inhabitants for the aftermath. To date, 12,000 people have completed a Citizen of Oakland Respond to Emergencies course. It gives them the basic know-how to survive up to 72 hours without professional help. "These are just average people from all walks of life," says Colleen Bell, Oakland's emergency planning coordinator. "If there is a big earthquake, their job is to take care of themselves and their neighbourhoods because we can't be everywhere at once. "They know where the vulnerable people are in their area; they know where all the gas shut-off valves are; they know how to do light search-and-rescue if a collapse has occurred and they hear people screaming and hollering."